If you’re looking for a pickup that can handle tough jobs without the associated cost and dismal fuel economy of a full-sized pickup – meet the 2019 Toyota Tacoma. The Tacoma has the long standing reputation, of being the best truck out there for retention in value. It is unbelievable how much of a beating these trucks can take. They have proven themselves over and over again. With that said, finding a used one can prove difficult, as they are in demand, so, if we don’t have what you are looking for at the moment, be sure to call and let us know what you are after so we can keep you in the loop. Buying a new one is a no-brainer, as it will be great while you own it and you will be impressed with your resale value when you go to make your next move. No other manufacturer out there can say quite the same, when it comes to how these hold onto their value. Recently redesigned, this pickup is more than capable of handling the tough stuff, especially in TRD Off Road trim. It also comes with intelligent features like 60/40 split folding rear seats and a power sliding rear window to help you enjoy your off road adventures! The Tacoma is our second most popular vehicle sold at Collingwood Toyota, next only to the RAV4. We know trucks well and are the best place to shop for your next Tacoma. For 2019 there have been some exciting changes in colour choices. All new for this year, you can get Cavalry Blue. This is a very cool colour and the Tacoma looks amazing in it! Find your perfect Tacoma at Collingwood Toyota in Collingwood, ON. 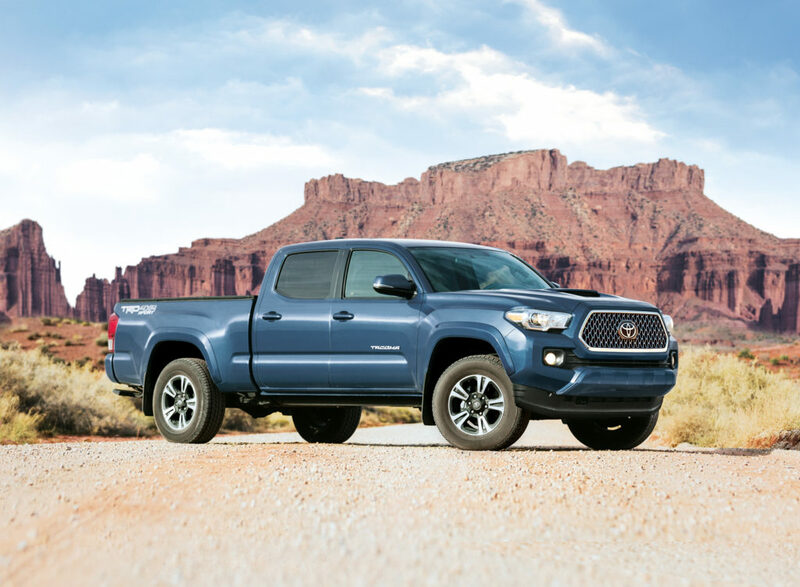 Our New Vehicle Inventory has all the brand-new Tacoma’s you could desire, while our Used Vehicle Inventory may have some used Tacomas for your consideration. Equipped with either a hearty 2.7L engine or beefy 3.5L V6, the Tacoma can tow a maximum of 6,500lbs with the available Towing Package – which includes a Class IV hitch and 7-pin wire harness. The standard rearview camera integrated into the 6.1-inch touchscreen also makes hooking up a trailer a snap thanks to its high-definition display. Plus a 120v outlet in the bed means you can run your equipment right off your Tacoma! Want to take the road less travelled? The 2019 Tacoma is up for anything you throw at it! 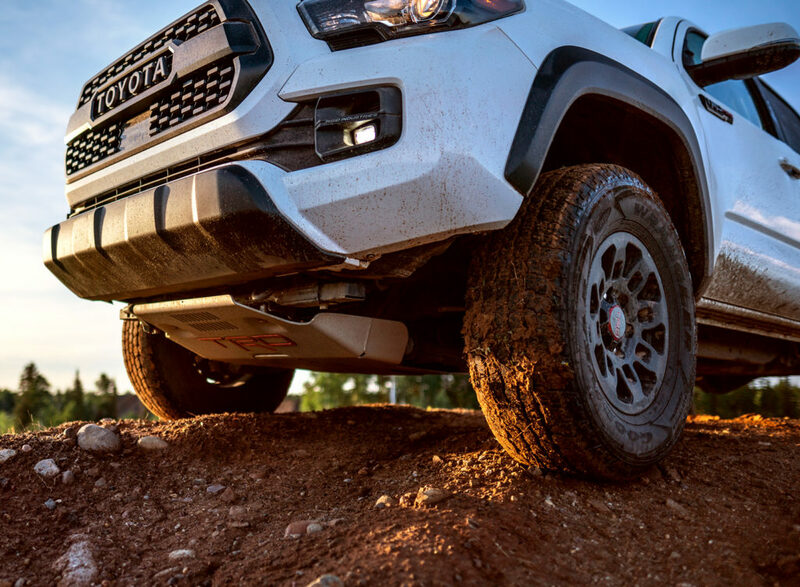 With the TRD Pro edition, you get features like Bilstein shock absorbers and TRD Reservoir Suspension kit, locking rear differential, and even Wrangler All-Terrain Kevlar-reinforced tires to ensure that nothing gets in your way. Plus Crawl Control and Multi-Terrain Select (AT only) lets you adjust your Tacoma on the fly to suit the conditions. Good safety systems are the ones you never notice – not unless you need it. That’s why the 2019 Tacoma is equipped with a total of eight airbags for all passengers – to protect you when you really need it. Plus other items like stability control, traction control, and even an optional Blind Spot Monitor help you remain in control no matter what the road throws at you. 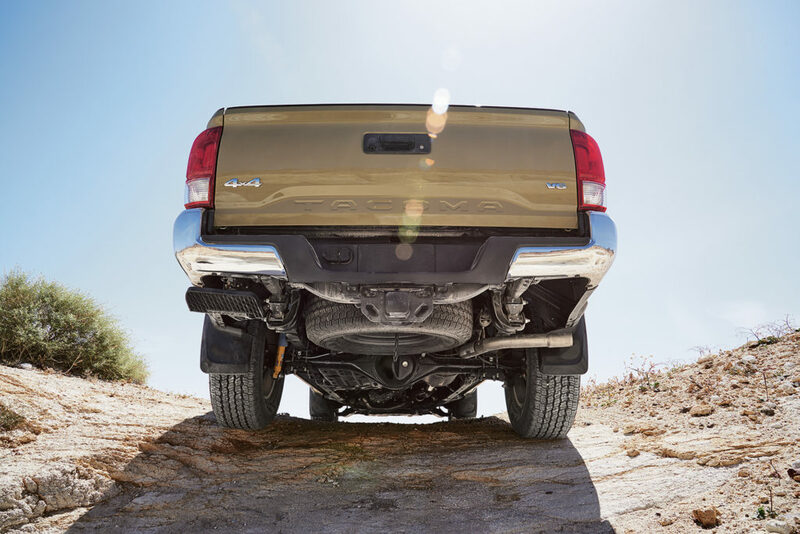 Every Tacoma also comes standard with Toyota Safety Sense, giving you a pre-collision system with Pedestrian Detection, lane departure alert, automatic high beams and dynamic radar cruise control. The 2019 Toyota Tacoma was made to be customized to suit your needs! That’s why Collingwood Toyota carries genuine Toyota parts and accessories like running boards, all-terrain tires, TRD-style wheels, and HID light bars – among many other items. Order Your Parts today and have our factory-trained service technicians install everything for you.